This book, a companion volume to Gospels and Acts, is an omnibus edition compromising four titles in the Navarre Bible New Testament. 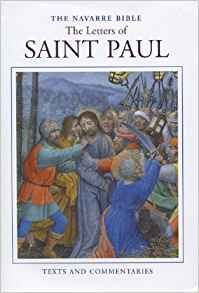 These are: Romans and Galatians, Corinthians, Captivity Letters (Ephesians, Philippians, Colossians, and Philemon), and Thessalonians and Pastoral Letters – all the texts directly attributed to St. Paul. Like the Gospels and Acts, this edition contains these New Testament books and commentary in one convenient volume.